Add a name to each shirt for no additional cost. It will appear vertically below the bow tie along with the word ‘groomsman’. Wanna be formal and laid back at the same time? 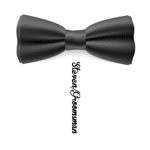 Allow us to introduce the Personalized Groomsman Bow Tie T-Shirt for your wedding party men. This 50/50 cotton/polyester blended shirt is as comfortable as they come. It will also help you remember which group you’re with after you’ve thrown back a few. Available in sizes small through XXL.